â€¢Blu-ray Disc - The high definition Blu-ray Discâ„¢ format provides pristine video and audio quality for your home entertainment. â€¢BonusVIEW - BD "Profile 1.1" enables "picture-in-picture" and secondary audio features for viewing director or actor commentary while the main movie is playing. â€¢BD-Liveâ„¢ - The BDP-83 support BD "Profile 2.0" and contains all necessary hardware - audio/video decoder, Ethernet port, and 1GB of internal storage - for BD-Live. â€¢DVD Up-Conversion - The BDP-83 uses the same VRSâ„¢ by Anchor Bay (DVDO) de-interlacing and scaling technology as in our award-winning DV-983H DVD player. The up-converted picture quality bridges the visual gap from your current DVD library to Blu-ray discs. 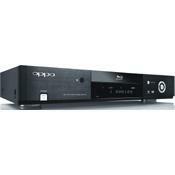 â€¢DVD-Audio - The BDP-83 plays DVD-Audio and supports both stereo and multi-channel high resolution audio programs. Users can select whether to play the DVD-Audio or the DVD-Video portion of the disc. â€¢SACD - The BDP-83 plays Super Audio CD (SACD) and supports both stereo and multi-channel high resolution audio programs. Users can select whether to output the DSD (Direct Stream Digital) signal in its native format or convert it into PCM. â€¢Additional Media Formats - Additional disc and file formats, such as audio CD, Kodak Picture CD, AVCHD, MKV, and other audio/video/picture files on recorded discs or USB drives can be played back on the BDP-83. â€¢VRSâ„¢ by Anchor Bay - The BDP-83 incorporates Anchor Bay's award-winning Video Reference Series (VRS) technology, and delivers a picture that is cleaner, smoother, true-to-life and free of artifacts. â€¢Full HD 1080p Output - The BDP-83 features user selectable video output resolutions, including 480i, 480p, 720p, 1080i, and up to 1080p 50 or 60Hz. â€¢True 24pâ„¢ Video - Many Blu-ray Discs are recorded at 24 frames per second, the same frame rate as the original movie's theatrical release. The BDP-83 can faithfully redeliver the original frames using 1080p 24Hz output (compatible display required) for smoother motion and a flicker-free, film-like home theater experience. It can also restore the original 24 frames per second progressive-scan video from well-authored DVDs and output as 1080p 24Hz. â€¢Source Direct Mode - For users who wish to use an external video processor, high-end audio/video receiver or display, the BDP-83 offers a "Source Direct" mode. The original audio/video content on the discs is sent out with no additional processing or alteration. â€¢Multiple Zoom Modes - The BDP-83 supports multiple levels of aspect ratio control and image zooming, including a vertical stretch mode for customers with a 2.35:1 CIH (Constant Image Height) display system. I have had this Oppo for over two years, picture quality was not too bad, but I did not have anything to compare to as it was my first Bluray Player. I was using it in a two channel stereo set up for audio, all I can say is that the sound quality is not that great, it is poorly focused, and lacking in detail. It reminded me of a Mission Speakers 760i, which had very poor focus and lacked musicality and detail. Cosmetics are great, looks really slick, I am thinking that may be the person who designed it, work for micromega, the French high end audio company, at one time. Would I recommend it to anyone? No, as I feel that it sound quality is very poor. I would not pay more then $299.00 for it, at this MSRP of $499.00, it has extremely poor value. Simply put this is one class act right out of the box. Solid build,smooth and FAST operation, outstanding DVD upconversion and Blu-Ray performance made possible by the Anchor Bay VRS chipset which is usually found in much more expensive players. Played everything I threw at it flawlessly on mySony 55" 1080p LCD via HDMI and through my Rotel audio components using the 7.1 analog inputs. This allows the lossless codecs of DTS Master Audio and Dolby HD decoded by the Oppo to be used through the non-HDMI cabable Rotel processor. The speed is the real game breaker here. This player cut from a half to two thirds off the load times of my former Panasonic BD-80. Super easy setup and lots of fine settings if you inclined to pursue them. The rest of the industry should take note of Oppo's packagng. Inside the sturdy box the unit is presented in a nice cloth sack with the Oppo logo. A separate box holds the substantial detachable power cord, remote and a very nice HDMI cable. The manual is nicely printed on heavy stock and is clearly written. At around $500 this is not the cheapest player out there but, for the same performance level, is the equal or better than much more expensive offerings. Pros: Well built, sleek desgin, excellent backlit remote, quick loading times, front panel usb port for firmware upgrades. Great manual, easy set-up and menu trees. Excellent sound and picture. Cons: Expensive (but worth it) Amazon provides free shipping and no sales tax, while OPPO hit me for $17 shipping and handling. No way to watch Netflix or other services but who cares? Summary: After spending over a year with my upconverting Oppo DV-981HD I vowed to wait till hell freezes over to get a Blue-Ray player with the OPPO name on it. It was a long wait but definately worth it. Great piece of kit, American made and well executed. I can't recommend this company or it's products more highly. Lets me say its been just about a month since the Bdp-83 arrived first impressions are great Oppo has delivered a first rate universal player when you recieve it you will know as you unpack it your in for a treat the BDP-83 was made for guys like us. First video prosessing is reference grade using the spears & munsil calabration disk included if you like a film like image or you want to see every pore on your favorite actors face this player delivers, on the audio side I used everything from cd , sacd,dvd/audio I used the hdmi into my Pioneer Elite Vsx 94 It sounds great bue it sounds much better using analogs for multi channel music but im trying to keep my cables to few as possible. it come shipped with the latest firmware installed so no need its plug and play calabrate and enjoy the best, It just shows how the consumer have been ingored by the big boys we pay big money for a display and are offered mass market sources to display them with. Thanks Oppo for taking the time to do it right the first time it can only wonder what you have planned next . DO NOT GET IT YET! I got it on the basis of one review and my previous experience with an upscaling OPPO - excellent unit. OPPO has had this unit out for evaluation and review to Early Adopters. I got one of the first for regular consumer use. It will not play 24p correctly (a lot of flicker) - unacceptable top-end video output! It has intermittent video output - need to remove and reinsert HDMI connector repeatedly with background going to violet at times - unacceptable! Buttons on remote incorrectly programmed. OPPO wants me to install NEW software - their web site indicates that I have the latest on my unit - huh, which is correct? Maybe the BDP-83 is "not ready for Prime Time". On the upside, it plays CDs just fine - rather expensive CD transport. and this OPPO FAILS in the Performance Category!